Free Shipping Included! 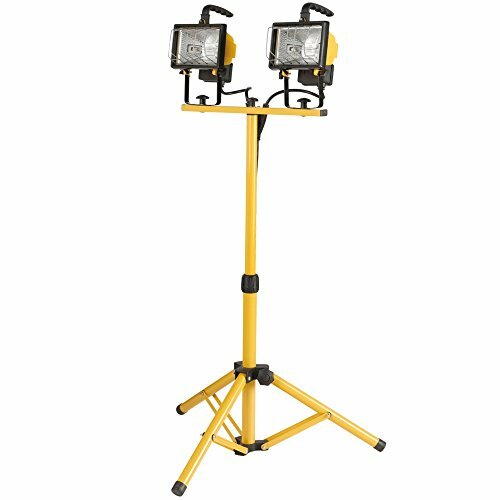 Globe Electric 500W Twin-Head Halogen Work Light, Yellow Finish, Adjustable Tripod, Bulbs Included, 6055701 by Globe Electric at N Online Agency. MPN: 6055701. Hurry! Limited time offer. Offer valid only while supplies last. Globe Electric's 500W Twin-Head Halogen Work Light comes equipped with an adjustable tripod making it ideal for most work or home construction jobs. Globe Electric's 500W Twin-Head Halogen Work Light comes equipped with an adjustable tripod making it ideal for most work or home construction jobs. The gripped carrying handle makes transporting this light a breeze. The tilting head insures you can direct the light to where you need it most while the shadow fighter grill helps to reduce shadows so you will always have the best quality lighting. Perfect for jobs in the garage, shed, basement or workplace this light is weather resistant so you can use it outside too! Includes two 250W halogen bulbs. If you have any questions about this product by Globe Electric, contact us by completing and submitting the form below. If you are looking for a specif part number, please include it with your message.